It’s a system extremely useful and irreplaceable to the search rankin precision welding heads mounted on robots. The principle of the 3D reconstruction is exploited to perform the mapping of the welded area and go to seek the salient points that identify the weld joint. 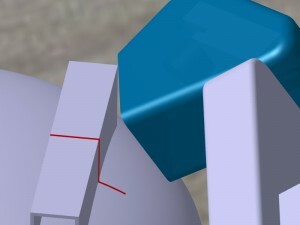 Indispensable when it’s necessary to provide the control system of the robot the location of the weld joint in three spatial dimensions (X, Y and Z), is also particularly suitable in all those situations “visually complex”, where the artificial systems based on acquisition and processing produce uncertain results. The heads of the acquisition AceLabs can be mounted either on a permanent basis on the wrist of the robot, both hooked and unhooked from the clamp-objects where lack of space or protection of optical components require.